View towards Lake Eildon & The Paps from Golden Mount escarpment. 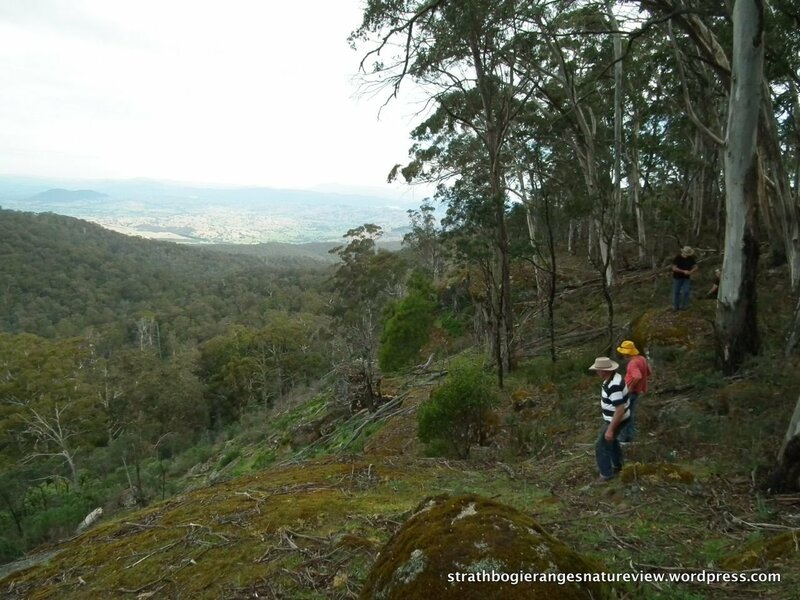 At 1028 m, Golden Mount is the second highest peak in the Strathbogie Ranges, complete with some Snow Gums on top. Immediately to the east of the peak is a spectacular and steep rock escarpment that plunges down to the valley of Clear Creek, a tributary of Brankeet Ck. In spite of the rubbish left by visitors and the illegal off-road trail-bike tracks (all too common! ), it’s a glorious spot. And at this time of year there were quite a few wildflowers on show, though it’ll be better in a few weeks. If you visit on a week-day you’ll have the spot and the glorious serenity of those rocks, to yourself. Here are a few more pics; click a pic to start the slide show. View across the Clear Ck valley to Mt Tel & towards Mt Strathbogie in the distance. The Paps and the Mansfield Plain, with L. Eildon beyond. Ancient, gnarled Snow Gum (Eucalyptus pauciflora) growing out of near-solid rock. Yep – it was great!